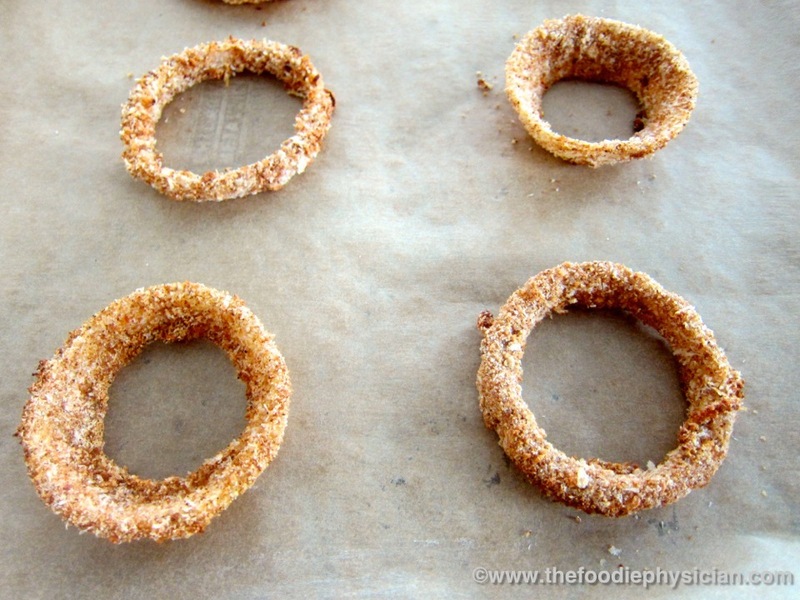 My Crispy Oven Baked Onion Rings are light, crispy and guilt-free! I’ve always loved onion rings but classic onion rings are usually deep fried, greasy and loaded with fat. Plus they always leave me feeling really heavy afterwards and a bit regretful. So I decided to perform a recipe resuscitation on this classic fast food favorite to create a guilt-free version without sacrificing flavor. My Crispy Oven Baked Onion Rings are light, crispy and have a hint of spice. Even better, they won’t leave you with that heavy feeling when you’re done eating. Traditional onion rings are deep-fried and soak up a lot of oil. I spray the onion rings lightly with olive oil before they go in the oven. The best way to do this is to use a cooking spray made with olive oil or a misto oil sprayer. They’re great for low fat cooking because the amount that comes out in a spray does not add a significant amount of fat to a recipe (I used about 2 seconds of spray for all of the onion rings which added only 18 calories and 2 grams of fat). It also promotes browning and gives the onion rings a nice golden color when they bake. The current USDA Dietary Guidelines for Americans recommend that at least half of all the grains you consume should be whole grains. Whole grains have high amounts of fiber, vitamins, minerals and antioxidants. White whole wheat flour is a whole grain product that has all of the nutritional benefits of traditional whole wheat but with a lighter color and milder taste. Click here to read more about white whole wheat flour. Buttermilk is naturally low in fat and has a nice tangy flavor. It’s a great option when you’re making any dish that’s breaded. Although I love the texture of panko breadcrumbs, they aren’t very nutritious. By combining panko breadcrumbs with whole wheat breadcrumbs, you still get the light, crispy texture but with all of the health benefits of whole grains. Let’s face it- butter and fat add flavor to food. So to add lots of flavor to the dish without adding fat, I like to use spices. My onion rings have a Southwest flair with chili powder, garlic, cumin and a little bit of cayenne pepper. Feel free to kick up the spices to suit your taste. So go ahead and try these healthy, delicious homemade treats the next time you have a fast food craving. Trust me, you won’t regret it! Slice the onion into ¼ -inch slices and separate the rings. Set up a breading station. Place the flour in a dish and mix in ¼ teaspoon salt and 1/8 teaspoon pepper. Pour the buttermilk into a bowl. Place the breadcrumbs in a mini food processor to grind them up finely. Alternatively, you can place them in a plastic bag and then crush them with a rolling pin. Grinding them up finely will help them adhere to the onions. Mix the breadcrumbs in another dish with the chili powder, garlic powder, cumin, cayenne, ½ teaspoon salt and ¼ teaspoon pepper. Working with one or two onion rings at a time, place the onion rings in the flour and toss them around to coat them well. Then dip the rings into the buttermilk. Let the excess buttermilk drip off and then place the rings into the breadcrumbs. 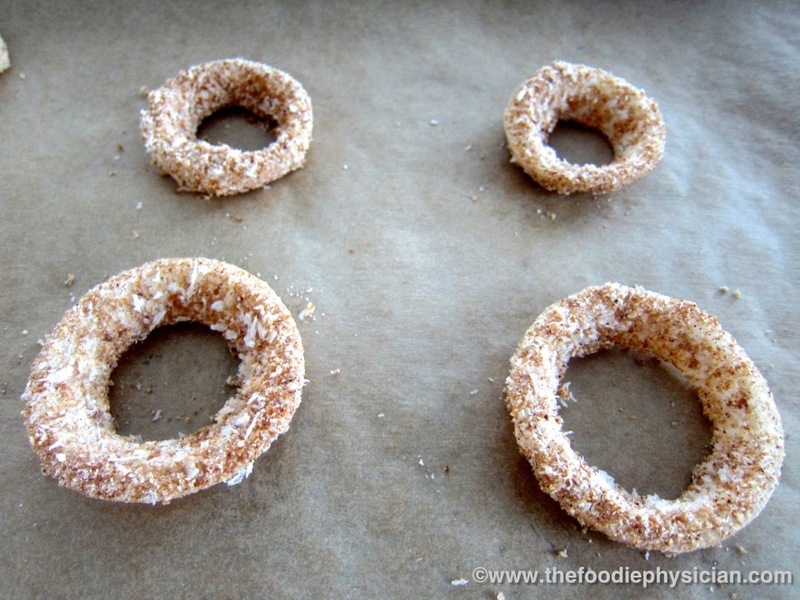 Turn the rings around in the breadcrumbs until they are fully coated. This will work best if you do a couple of rings at a time otherwise the breadcrumbs will get clumpy. Carefully lift the rings from the breadcrumb mixture and place them on two baking trays lined with parchment paper or aluminum foil. Spray the onion rings lightly with olive oil spray and place the trays in the oven. Bake about 15 minutes until the onion rings are golden brown. Remove from oven and serve immediately. For nutritional calculations, I only used the amount of flour, buttermilk and breadcrumbs that adhered to the onion rings. The rest was discarded. My husband is a HUGE fan of onion rings so I will definitely have to make these! Looks like a terrific recipe!!! These sound great! i have never tried baking onion rings at home. I will have to try it out! Thanks- let me know how it goes if you try the recipe! Looking for a veggie to go with Sloppy Joe's and these onion rings sound delish and easy. I agree- I think these would go great with Sloppy Joe's. Thanks for stopping by! oooh! i have to try your baked onion rings! Never actually made onion rings before since I was worried about all that deep fried fats! haha.. Yes, these have significantly less fat than the deep fried version. Enjoy! I am so planning to try this today!! These onion rings are so amazing!! My husband prefers onion rings to french fries but trys to stay away from both of them because they are soaking in oil. He can eat the baked onion rings, all he wants, without feeling guilty.I am definitely going to try this recipe. I've never seen more beautiful looking onion rings. I'm on this major unprocessed health food kick. After reading several articles on the dangers of the commercial oils we use and the preservatives and such that go into so many things we buy off the shelf, it has really opened my eyes to eating more clean and healthy. I'll be pinning a lot more of your recipes and this one is a perfect place to start! I hope you are enjoying your new home and environment. Welcome to S. FL! On the Healthy Kids Child Wellness and Weight Management Program, I am always looking for delicious ways to get more veggies into reluctant kids. I am sure this is one! The fact that these are baked not fired make this a winner for everyone. Thanks! Thanks for your comment, Jennifer. Your site is terrific! I apologize if this is a double post. I know this is an old post, but will ask anyway. I've found there are a lot of things I used to fry that are crispy and delicious baked. I don't miss the mess either! I have one question, you used a combination of panko and ww breadcrumbs. Why not just whole wheat panko? Or does it need that texture of the finer ground breadcrumbs? I almost always have both whole wheat panko and breadcrumbs on hand. I'll definitely be making these! That's a great question, Janet! I use a combo because you need the finer texture of the regular breadcrumbs to adhere to the onions but I like the texture/crunch of panko. Plus, it's sometimes hard to find whole wheat panko breadcrumbs. If you have them, you can definitely use them! I would just grind them up in a food processor first to get them a little finer. Please let me know how they turn out!